It is hot here in Arizona (108 degrees at last check) and nothing says summer like a cool, refreshing beverage. 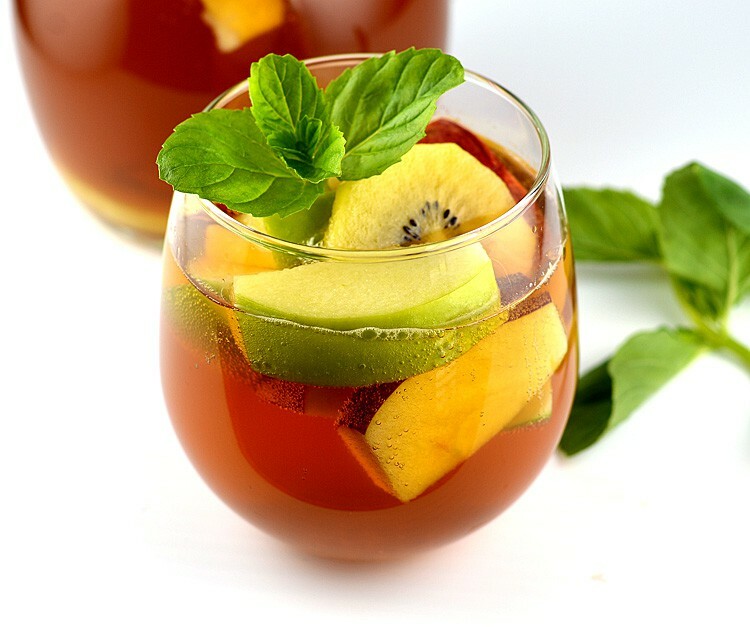 Our Iced Tea and Lemonade Sangria features copious amounts of seasonal fresh fruit, an optional simple syrup and sparkling white grape juice. In our family, there is always a pitcher of iced tea made and ready to enjoy. 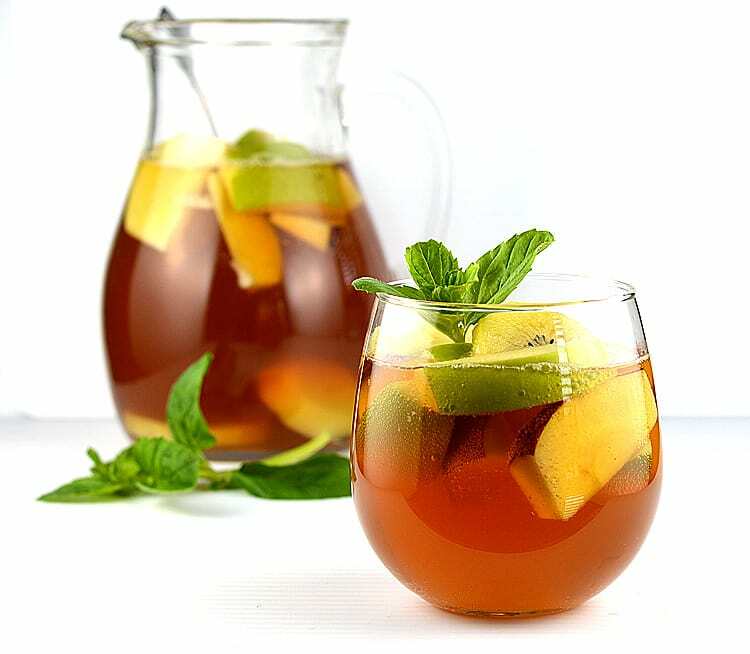 Today, we’re partnering with Bigelow Tea and their Iced Tea & Lemonade for this recipe making ours into a fruity Sangria. The perfect complement to any backyard barbecue or poolside picnic! 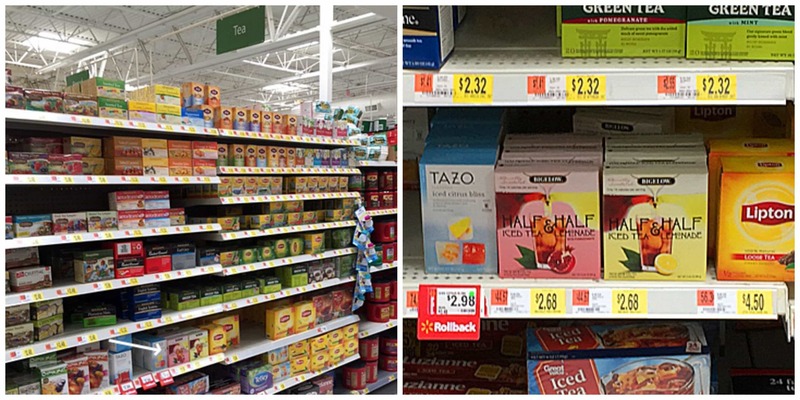 We located the Bigelow Half & Half Iced Tea and Lemonade in the coffee and tea aisle in our local Scottsdale, AZ Walmart store alongside the rest of the Bigelow Teas. There are 6 family sized (quart) tea bags in each box. The recipe is simple. We just brewed 2 of the quart sized bags in 2 C of boiling water. To that, we added 6 C of cold water. At this point, you can taste test to see if you’d like it sweeter. We made a simple syrup consisting of equal parts sugar and water dissolved in a sauce pan over medium heat and then cooled to room temperature. Remember, if you are using something like white grape juice, it will add some sweetness so don’t go overboard. Now comes the fun part. 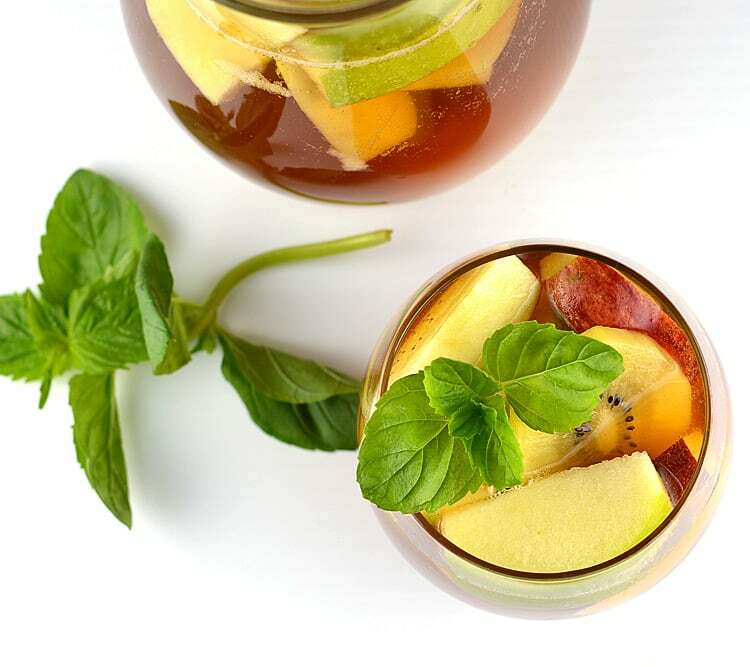 The measurements are not important here, just add lots of red and green apple slices, kiwi fruit and frozen grapes if you’d like…any combination you enjoy with a sprig of fresh mint for garnish. Just prior to serving, we pour in an entire bottle of sparkling white grape juice. Alternately, you could really use any vegan sparkling beverage. And that’s it! Ready to serve to your guests. Here are some fun facts. Bigelow Tea is America’s largest family-owned tea company and is celebrating its 70th anniversary this year. Bigelow began in a New York City townhouse, where Ruth Campbell Bigelow developed the iconic “Constant Comment”® tea, and has expanded to a worldwide market offering more than 130 varieties of flavored, green, organic, herbal, decaffeinated and iced teas. They believe in freshness, which is why they use a special foil pouch to protect your tea from air, moisture and surrounding aromas. So open and enjoy the unparalleled flavor, freshness, and aroma of Bigelow Tea everywhere you go! Be sure to check out more Bigelow Tea flavors and brand history at bigelowtea.com.